Happy Chinese New Year! The title for today’s post is the name of a tune that’s been running through my head. Roughly translates as “The Spring comes” (someone correct me if I’m wrong ^^;)- rather fitting for the season, no? It’s from the Kaze Hikaru Sound Collection- which, for a manga spin-off product, turned out to be a pretty good buy- some lovely tracks in there, “Haru” is my favorite out of them. Since according to the chinese zodiac it’s the year of the Rat, the ole cat and mouse duo (see the post dated 2006-08-16) popped into my head again and a few videos of old Taiwanese period drama serials on youtube completed the mood. 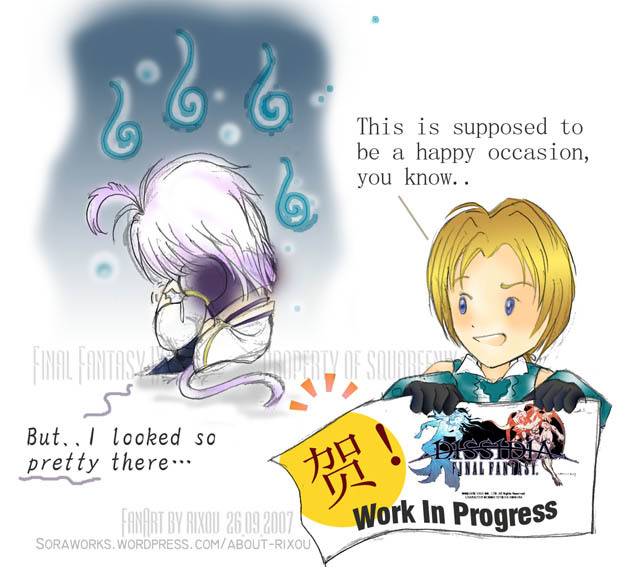 First of all in the News: Final Fantasy: Dissidia! Well then, what better to commerate the occasion than a celebratory picture? And I had just the image in storage too: all penciled and cleaned up, just lacking that final burst of energy to color and spit and polish and what better time than now.